I came across this NY Times article about a small black bear named Yellow-Yellow that was able to defeat a well designed bear resistant food storage container. The method usually recommended for protecting food by placing it in a bag hung from a tree is routinely being defeated by bears that have figured out that an easily cut/bitten rope is usually not far away from their goal. Never underestimate the power of perseverance, patience, and practice. Intelligent defenders can often be outwitted by the less brainy with an excess of spare time and focus. Or put another way, multi-taskers don't always win. The folks at Bear Vault clearly get it (vis-a-vis their adversary) whereas, sadly, the folks at software companies often do not. And a great quote attributed to a Yellowstone Park Ranger on bear-proof garbage cans was "Turns out there is considerable overlap between the stupidest human and the smartest bear." Never, ever, market anything as being [something]-proof. Interestingly I didn't find this on a camping or scouting site but through an information security site Emergent Chaos under the topic "Penetration Testing Your Products." BTW. If you don't know about penetration testing, basically it is the practice of testing the security of something (such as a computer or network) by breaking into it. While this sounds all very exciting, the key thing to remember above all is that any testing of this kind requires formal permission (i.e. contracts). Any testing without permission (and I mean the kind of permission that can hold up in a court of law) could find you charged with a felony, indictable offense, or similar serious criminal charge in many countries. For more information see Penetration Testing and Ethical Hacking. Space historian, Randy Atwood will be giving a fascinating presentationon the Apollo 11 Landing and how it narly failed. Following thatStaff from Khan Scope Centre will be running a beginners telescopeworkshop presentation. This event is at the Ontario Science Centre located at 770 Don Mills Road (at the corner of Eglinton Avenue East) Toronto, Ontario. Forty years ago this July 20,the first men landed on the Moon. How close did Armstrong and Aldrincome to failing to make this first landing? Closer than you may think. A long list of human mistakes, poor design and just the unknowns oflanding in the lunar environment made the 12 minute descent a hairraising adventure which more than once nearly forced the lunarexplorers to call off the landing attempt and return home as footnotesto history. Do you have or are you planning on getting a telescope? Experts from KhanScope Centre will explain how to get the most out of your telescope!Learn some of the tips and tricks that make using an astronomicaltelescope easy. Weather Permitting, Telescopes will also be set up for Astronomical Viewing. Ken the Lunar librarian hosts his 5th Carnival and being the 40th anniversary of the Apollo 11 landing, it is full of articles on the Moon and Apollo. There are also lots of other spacey articles. Check out The 112th Carnival of Space - The Big Moon Day Show at Out of the Cradle. I enjoy many of the shows that air on The Discovery and a History channels. Mythbusters, Doing DaVinci, and MayDay to name a few. But there have been a few specials that weren't so special. "The Crystal Skulls" and "Nostrodamus 2012" are examples of real stinkers. The History Channel recently aired the 2012 piece and it was chock full of the kind of high quality fertilizer best left inside a KYBO (for non-scouts a KYBO is an outhouse). Nostrodamus 2012 claimed catastrophes attributed to the Hopi Indian "Blue Star", Galactic Super waves, and Galactic and Planetary Alignments. Complete hogwash. I won't even try to debunk all of these because others have done a fine job already. I'd recommend Ian O'Neill's articles on 2012 over at Astroengine as a good place to start. One of his best "2012 Doomsday Fabrication: Abusing Science and Making Money" with its follow the money common sense should foster some critical thinking. Firstly, if all the planets line up with the Sun then Mercury and Venus will be directly between Earth and the Sun. When this happens we can see the planets pass across the face of the Sun as black dots. So if the planets align in 2012 then both Mercury and Venus should transit the Sun as seen from Earth. And while the next transit of Venus is in June 2012, the next transit of Mercury is in 2016. QED - no alignment. Secondly, if you're still doubting, the planets don't align. Not even close. How do I know? Simply by charting the positions of the planets and looking at the result. Below you'll see the inner and outer planets charted using the JPL Orbit Simulator. The date is December 21st, 2012. The planets aren't even close to being aligned. Again, QED - no alignment. In case you're curious the reference to Sedna was because I needed to give the orbit simulator an object that was not a planet. So I picked the farthest one I knew of and zoomed in. Pork ribs, beef ribs, wet ribs, dry ribs, pulled pork, chicken, corn-on the cob, corn bread (it's really cake not bread), and much more. If you like BBQ, you may want to check out one of the many Ribfests being put on all over Southern Ontario this summer. Ribfests are like mini fairs. Some of these have been running for 20 years. These events are organized by local groups such as the Rotary, Kinsmen, Big Brothers, and more. Typically entry is based on a small donation that goes towards local service projects. My only regret is that it's not easy to sample the many different ribs unless you can bring a small army of people to keep down the waiting and spread the cost. The main attraction are the Ribbers, who vary from event to event. I've listed a sampling below. Not all of them have web sites. Most of the ribbers have trailers and tall banners proclaiming their victories with their many trophies on display. There are also entertainment, shops, giveaways, and small rides for kids. BTW. For students thinking of summer employment next year, some of ribbers hire local help for the summer. A few have even relocated from the deep south to southern Ontario. One thing that astronomers and Scouts share is being outside at night during the summer. 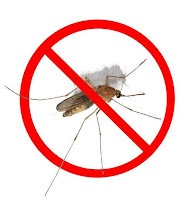 That also means one other thing - Mosquitoes and other biting insects. 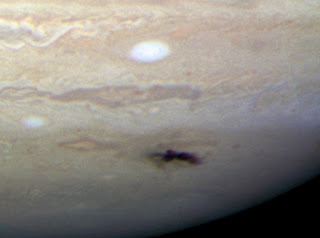 While bug repellant works well in most cases, it causes problems for astronomers. In particular DEET can damage plastic and the expensive optical coatings on lenses. If you're an astronomer or camper looking for a new edge in the battle of the bug, there is a piece of kit you should consider. The Thermacell - a small appliance that requires butane cartridges and pads. I have one and it works remarkably well. I've field tested it in fields southern and central Ontario as well as on the beaches of southern Maine. Here's a detailed review of the Thermacell over at the One Minute Astronomer. I had seen the same review in Sky News last summer and thought it was worth trying. The Carnival is up and running again over at 21st Century Waves. The 111th edition celebrates the Apollo 11 launch. There are lots of interesting articles on the Moon, Mars, Sun, Apollo and one on project Icarus which was a plan to hijack the Apollo program and solve a hypothetical asteroid deflection problem. Ever wonder about just how big the International Space Station is? USA Today published a nice animation from NASA showing all the flights and modules added to it over the years. The ISS is now the brightest object in the night sky next to the Moon. If you want to see it, check out the Heavens Above web site and enter your location. If you're going to a Scout Camp, you may be able to find use on of my Combined Sky Forecast Charts. Have you ever wanted to get something in space named after someone? Well it turns out you can but it's not as easy as filling out a web form or paying some money. Lot's of people are interested in naming stars after someone (I regularly see queries from search engines for this). But, the truth is you can't really do it. There are lots of people who will take your money for a piece of paper. It will be for a star you'll likely never see and no one will recognize. If you really want to, use one of the free services mentioned in a related article and treat it as entertainment. If you discover a comet, they'll name it after you. And if you're a co-discoverer then you'll be hyphenated. In today's world there is a very good chance the other side of the hyphen is a robot telescope like LINEAR, Catalina, SOHO, or NEAT. With all the robots looking for stray rocks, the chances of double hyphenation (ouch) are pretty good. If you have a talk show you might be able to hijack a poll and get some space equipment, like a treadmill, named after you. But it turns out that there is at least one other way you might get to name something out there. And it's within reach of amateur astronomers. Mind you these are well equipped and skilled ones, but amateurs nonetheless. 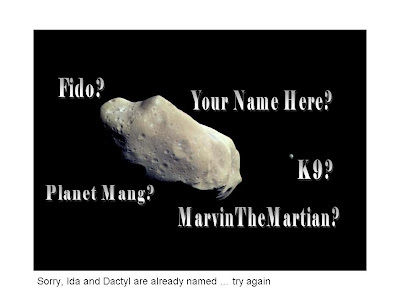 So if you what to name something in space go and discover an asteroid! Once you've found it you can pick almost anything your heart desires. There are a few naming rules (non-offensive, 16 or fewer characters, and reasonably distinct). You get your very own pet rock in space! Because the pace of asteroid discovery has picked up in recent years there are so many now that many will never receive names. Discoverers may take the lead of Mike Brown who discovered Vanth (moon of Orcus) by opening up for suggestions. And if your confused there is a source for the meanings of asteroid names. Finally, once you've named it or found one with a name that interests you, you can look up its orbit with the JPL Orbit Simulator. Just look up the name or number and go.